Focal epithelial hyperplasia (FEH), also termed Heck disease, multifocal epithelial hyperplasia, or multifocal papilloma, is a relatively rare, benign, human papillomavirus (HPV)-induced alteration of the oral mucosa, caused by low-risk human papillomavirus (HPV), namely the subtypes 13 or 32. The identification and typing of HPVs can be helpful to differentiate FEH from other HPV-induced lesions. It was first described in American Indian children in 1965 by Archard, Heck and Stanley. 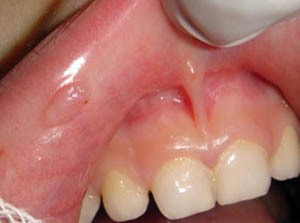 The lesions most commonly affect the oral and gingival mucosa, tongue, lower lips, and less often on the upper lip, in the floor of the mouth, soft palate, with multiple sites of occurrence. 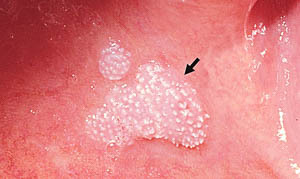 They appear as multiple or unique, aymptomatic, flat-topped or dome-shaped pink-white papules or nodules (usually 2-10 mm) that can coalesce in plaques. Each papule or nodule is flat-topped or sessile. 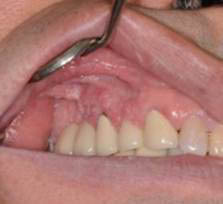 Even though it is typically papulonodular in shape, there is a papillomatous variant of FEH that tends to arise on the masticatory mucosa including attached gingiva and tongue. FEH occurs only in the oral mucosa, while other HPV-infected lesions such as squamous papilloma, verruca vulgaris, and condyloma acuminatum involve the skin, oral mucosa, and genital mucosa. FEH occurs in children, adolescents and young adults. The frequency of this disease varies widely from one geographic region to another. The majority of cases published since 1965 have described this entity in various ethnic groups in Eskimos and North, South and Central American Indians. Among Caucasian FEH is relatively rare. 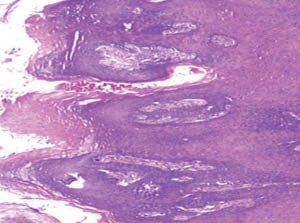 Biopsy is considered the gold standard for diagnosis of FEH. 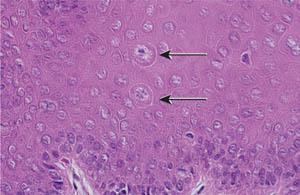 The histologic features are epithelial hyperplasia with deep papillomatous projections, prominent acanthosis (left), and occasionally apoptotic or dyskeratotic cells with an apparent mitotic appearance (coarsely clumped heterochromatin which simulate chromatin in mitosis), called mitosoid cells (right). These cells, hallmark of FEH, are virus-altered keratinocytes with nuclei resembling a mitotic figure probably due to nuclear deposits of peptides from the viral capsids . They are usually within the spinous cell layer, but also at any levels of the epithelium. These three lesions occurs as a result of reactive reaction to an identifiable local injury, mild trauma or chronic irritation. Inflammatory fibrous hyperplasia, or fibrous hyperplasia, can be due to calculus, a sharp tooth, a broken filling, excessive plaque and other irritating factors. Clinically it is an exophitic mass, soft or firm in palpation, well-demarcated, normal colored or ranging to white or reddish. Sometimes the surface is ulcerated, or keratotic. 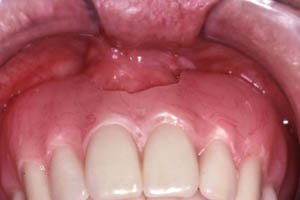 Inflammatory papillary hyperplasia (usually involves palate or lingual mandibular gingiva) is associated with ill-fitting dentures or partial dentures, wearing prostheses at night, poor oral hygiene; also candidiasis. 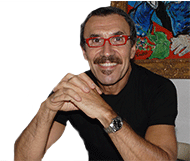 It affects middle-aged and older persons, 2/3 females. 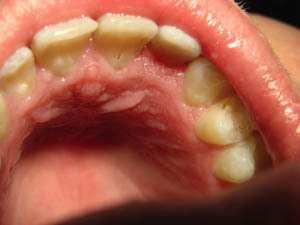 Verruciform xanthoma occurs in middle-aged persons, usually, as preferentially sites, in the alveolar ridge, hard palate, and gingiva have been noted as preferential sites. verrucous carcinoma is a low-grade variant of squamouscell carcinoma.that affects older (over 60 years of age) smockers individuals. It presents as an exophytic white mass with a verrucous or pebbly surface, from 1 cm to more extension, localized in the buccal mucosa, palate and alveolar mucosa. 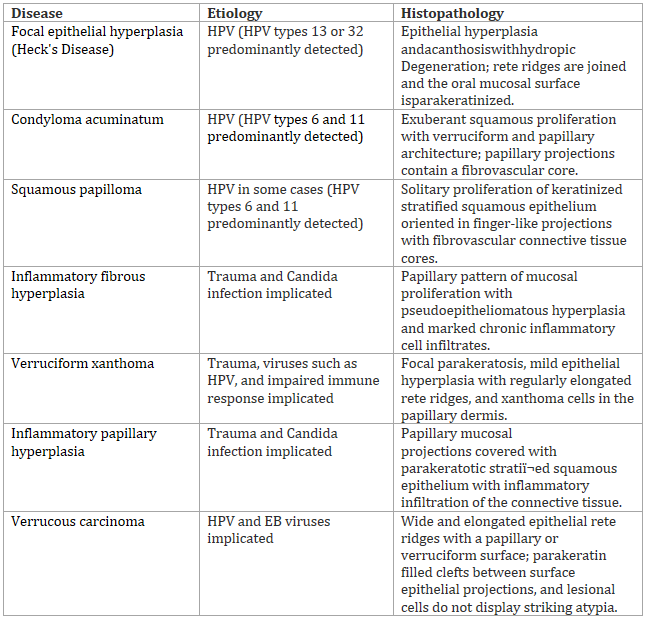 HPV is the probable involved etiology. The very important differential diagnosis is to condylomata acuminata, also caused by HPV: its isolated lesions are very similar but in FEH the lesions tend to be flatter and more numerous and the location of these lesions in the labial and buccal mucosa is very typical. Treatment of FEH is not always indicated as the lesions are asymptomatic and often regress spontaneously (after months or years). Surgical excision may be performed for the pathological confirmation of the diagnosis. First-line invasive treatments are cryosurgery, electrocoagulatory, and CO2 lasers. Topical interferon-β has been tried successfully.